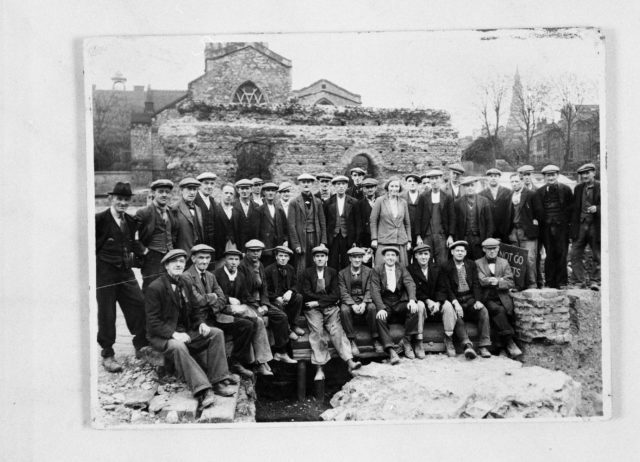 Everything we know about the Jewry Wall baths started with the work of Kathleen Kenyon and her team of workers, who discovered and excavated the baths between 1936 and 1939. 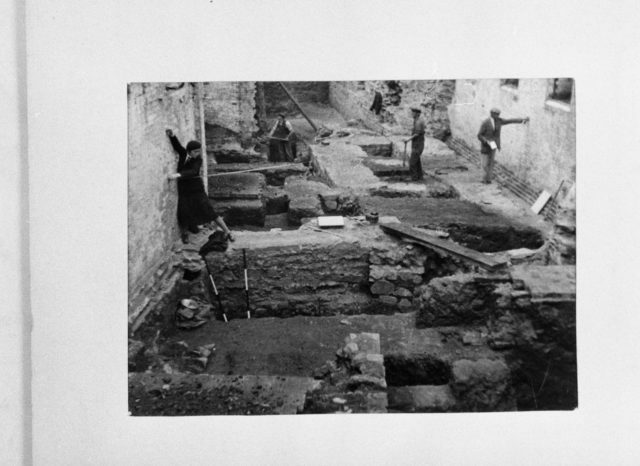 Across the front of the Jewry Wall is a masonry trench running at an angle beneath the full length of the cold bath house – this is the main drain. The drain would have taken surplus water from the reservoir or cistern. You can follow the route of the drain from the site of the cistern, across to a raised mound – this mound marks one of a pair of toilets inside the baths, located at either end of the cold bath house or frigidarium. 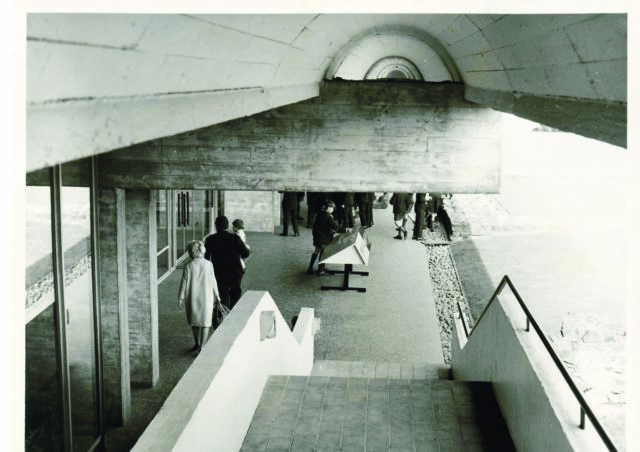 The drain runs around the site, under the second toilet block, in the direction of what is now Welles Street and so downhill towards the River Soar. 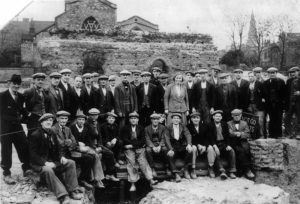 Kathleen Kenyon and the Jewry Wall dig. 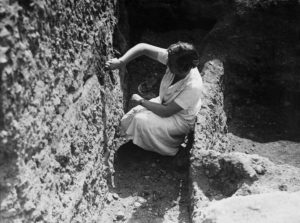 Kathleen Kenyon has been described as one of the most influential archaeologists of the 20th Century. 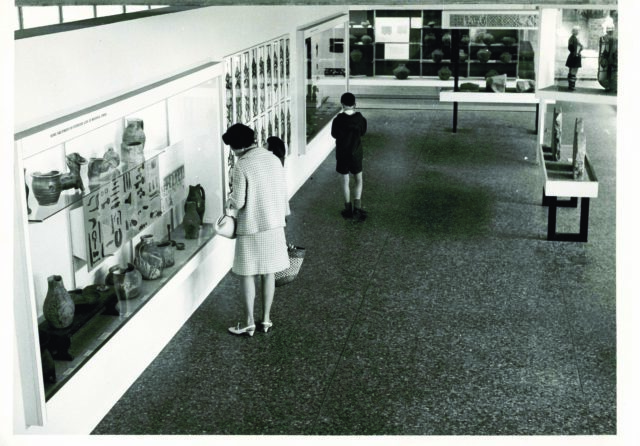 As well as the excavations at Jewry Wall in Leicester, Kenyon also led the excavation at Jericho in the 1950s and went on to be Principal of St. Hugh’s College at Oxford University. She was appointed as Dame of the British Empire (DBE) in 1973. 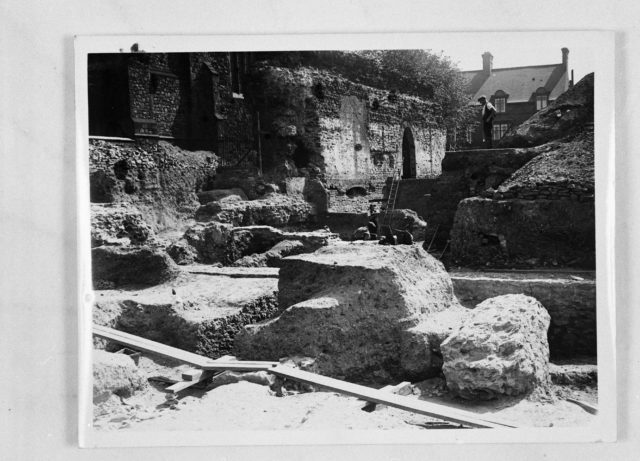 The Jewry Wall excavations were carried out between 1936 and 1939 and were brought about by the purchase of the site by the Corporation of Leicester for the building of municipal baths – the site where the ruins and the Jewry Wall Museum now stand was at the time occupied by Rust’s factory. 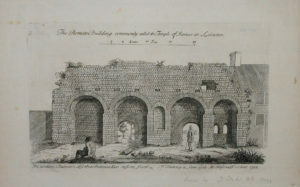 Excavation started at the same time as the demolition of the factory buildings – six feet of topsoil were removed before Kenyon and her team of workmen, students and other volunteers reached Roman levels and many thousands of tonnes of soil and modern masonry were removed from the site. 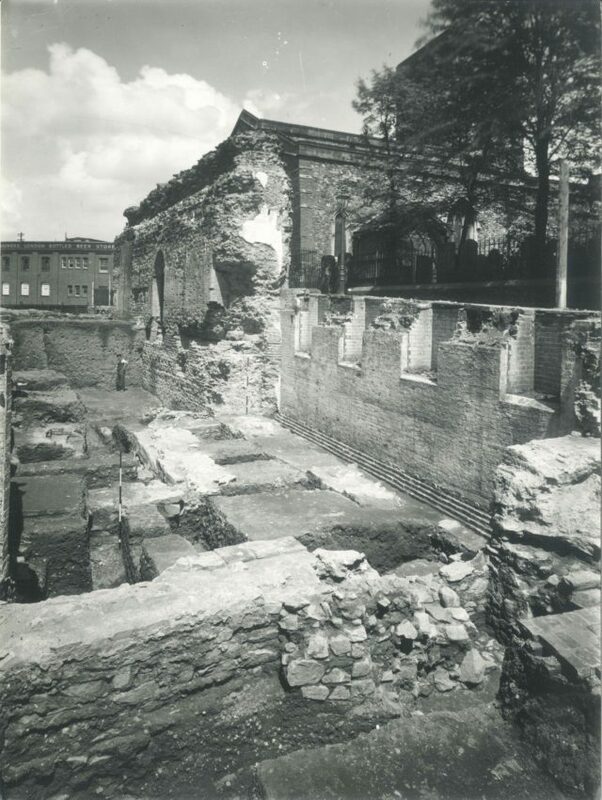 The excavation was not an easy task as modern buildings including a factory chimney, deep engine beds and some cellars had destroyed Roman remains – not to mention the activities of medieval stone robbers who removed material for use on other buildings. 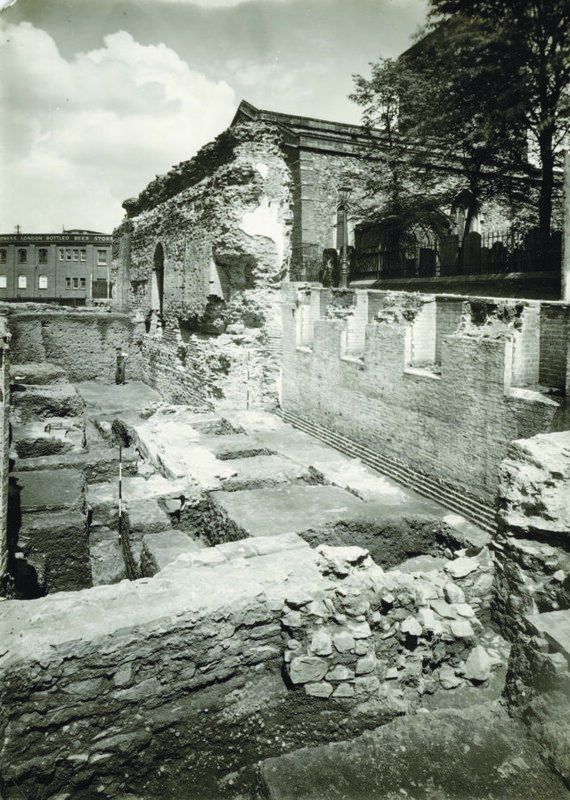 The Jewry Wall had long been thought of as an important Roman public building and one of the finest surviving bits of Roman masonry in the U.K. , however there was no agreement or information about what the building was. 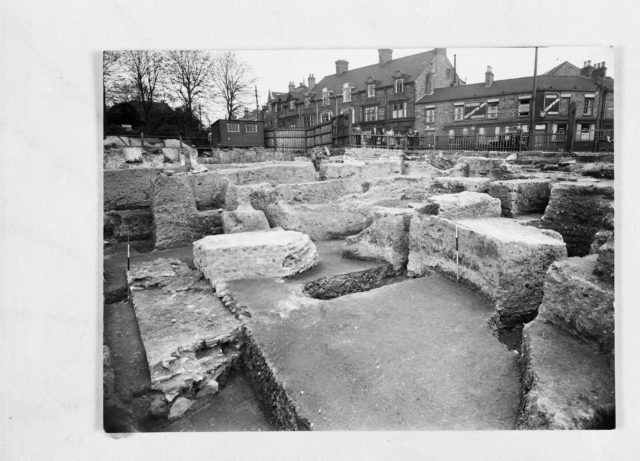 Kenyon originally came to the conclusion that the Jewry Wall was the entrance to Leicester’s Roman Forum, and it was finally agreed that the site would be preserved and laid out as a public monument. 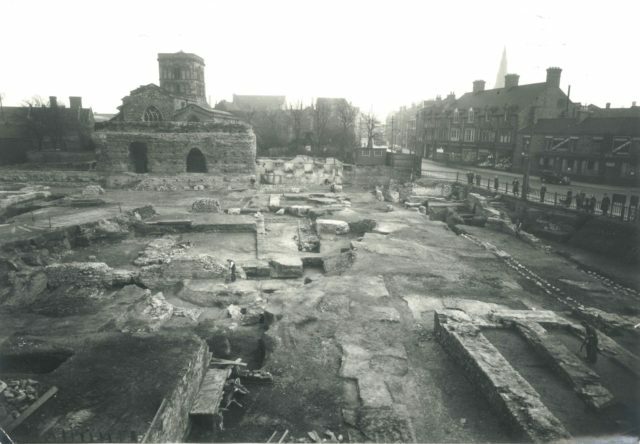 Following further excavations between 1961 and 1972 the true remains of the Forum were identified a block further east, during a rescue excavation when the Southgates underpass was under construction. 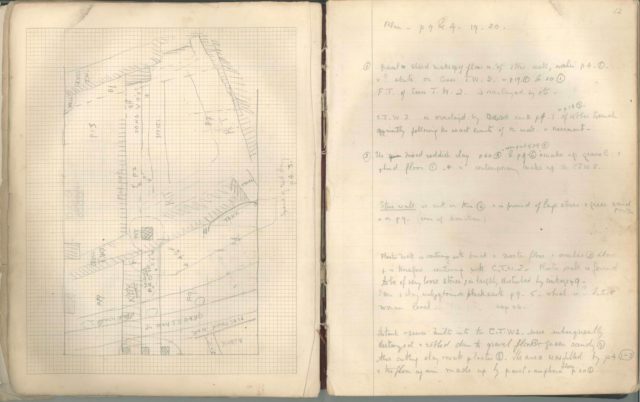 These excavations confirmed that the Jewry Wall was the entrance to the palaestra or gymnasium and part of a bath complex.